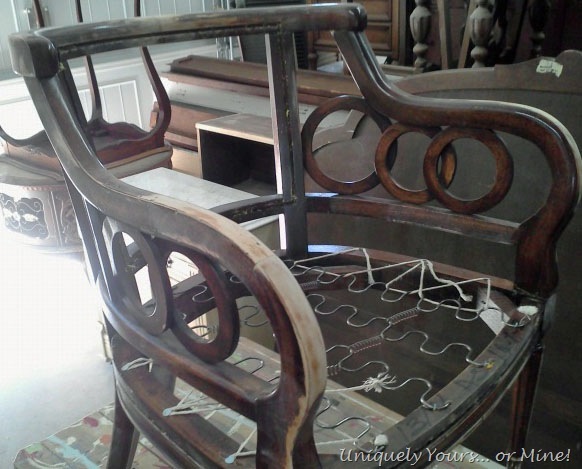 The Evolution of a Chair – Uniquely Yours… or Mine! I am doing something I have wanted to do for a VERY long time… I’m taking an upholstery class… I’m very excited to learn how to upholster the “proper” way! This is the chair I decided to update first… Lots of tufting should give me plenty of practice! Check out the cool arms on this chair! I removed all of the old fabric and saved it to use as a template for the new fabric. I then sanded down some of the rough areas on the chair and stained those areas in order to have continuity once I distressed it. I lightly distressed it to reveal both the French Linen and the stained wood, waxed it with Minwax paste wax then buffed it with a combination 0000 steel wool and a soft cloth. I made like a million buttons (ok, so it was only 35) but I used their button maker and WOW is all I can say!! If I ever get to the point where I am making a lot of buttons I will want one of these! It took me less than 30 minutes to make all of the buttons and they are ALL perfect! If you have ever made buttons with the cheap little set you get at the store you will understand how fast that is! Here’s a picture of my button maker! I hot glued the piping on after I trimmed all of the excess fabric… and she’s all done! I was planning on selling it… but not now… she’s all mine!!! Yay! The seat came out better than the back, but I’m very happy with the overall final look of the whole chair! It now has a permanent residence in our bedroom… where I get to admire it everyday! 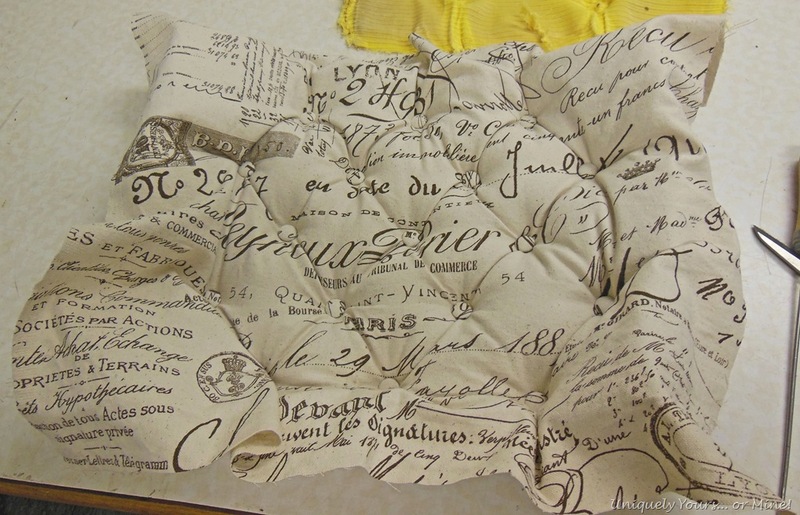 If you are ever interested in trying to do this yourself I’m sure there is a class in your area and I would highly recommend taking it… They provided all of the materials (except for the fabric) and the class size was kept pretty small. 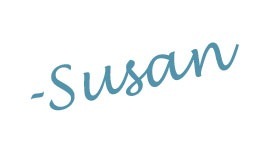 Gorgeous Susan! 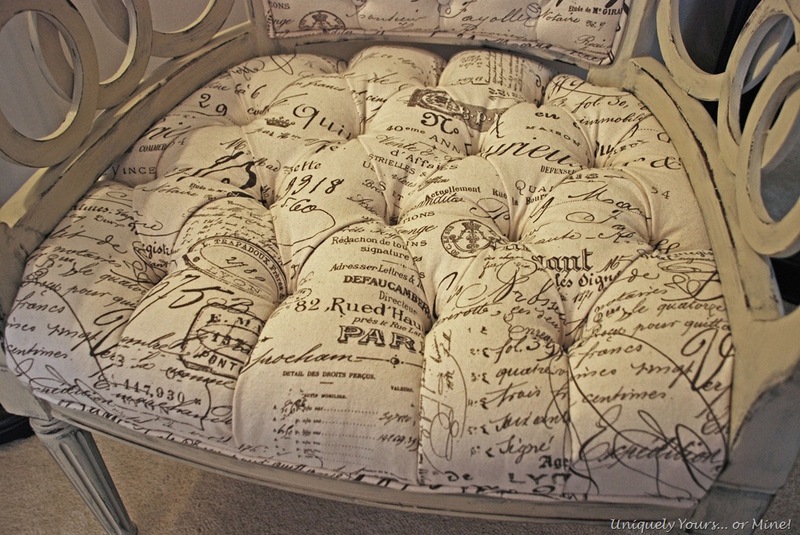 I love the fabric and the tufting really makes it special! Thanks Sharon! 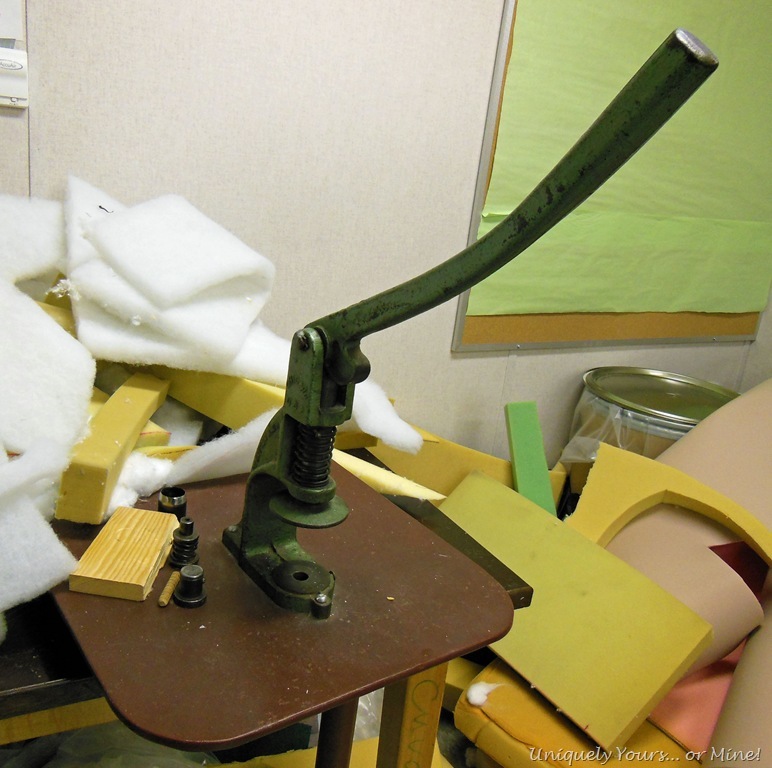 It was certainly a labor of love… good tufting is not easy! It’s amazing Susan! I would keep it too! 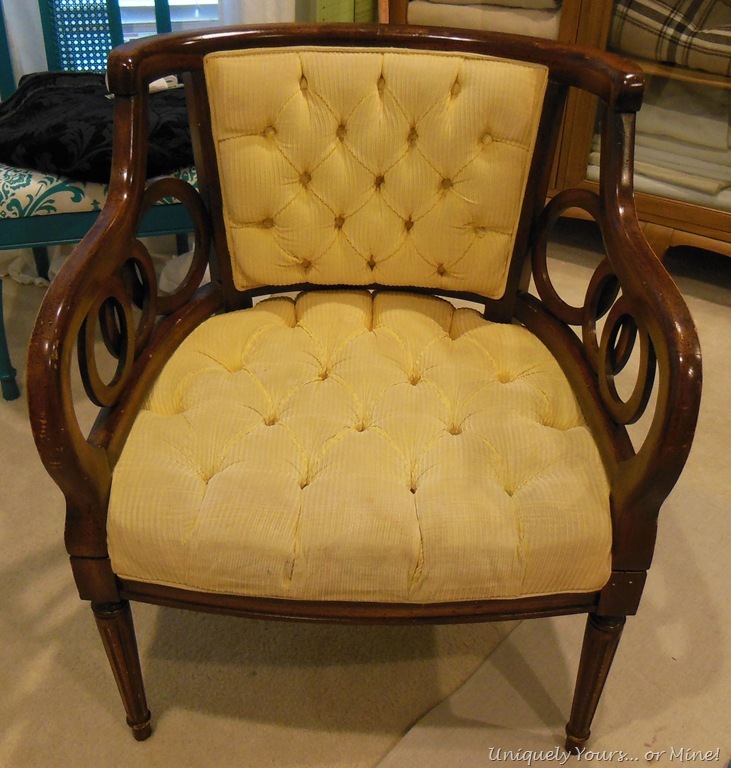 Have been thinking about doing a course in upholstery… I have a lovely chair in the garage that needs a major overhaul… I’d also love to do a tufted headboard. I love the arms on yours! Did you get the script fabric at Joanns? Thanks Kathryn! I would highly recommend you take the class! I got my fabric from a local discount fabric store “Ufab” it’s the same as Ballard sells but much cheaper… I think it was close to $20 a yard though so still not “cheap”.. This is FANTASTIC!! I love, love the fabric. If I had a place for it I would buy it for my house. Wow. When you decide to do something you go all out. Not just a regular upholstered chair for you — it’s got to be tufted! It’s beautiful. Love those arms too. 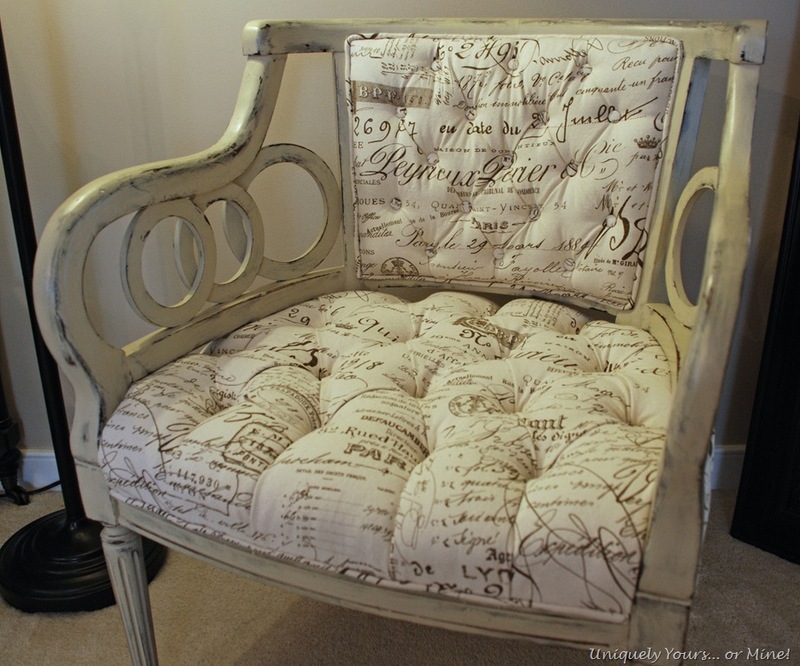 An upholstery class is on my list of New Year’s resolutions, and as always you’ve inspired me! You are sweet! Thanks so much! SAweet!! I bought a chair, I’m waiting on the books I ordered, and now have to buy a sewing machine! I can’t wait! Love how your chair came out! That’s awesome! Good luck finding the sewing machine… There are sooo many choices out there! Have fun! I know what you mean Anneke… This was my one thing for 2012! I hope you get the chance to fix it up and love it like I do mine Kathryn! It was so worth taking the class! Thanks so much for taking the time to comment and a special thanks for being a new follower! I hope you do get out and take a class, you will love it! I bought my fabric local, but it also can be purchased through Ballard Designs, they call it Document Brown… I hope you can find it in the UK! Stunning makeover! I love the new color and the fabric is just, well, stunning! 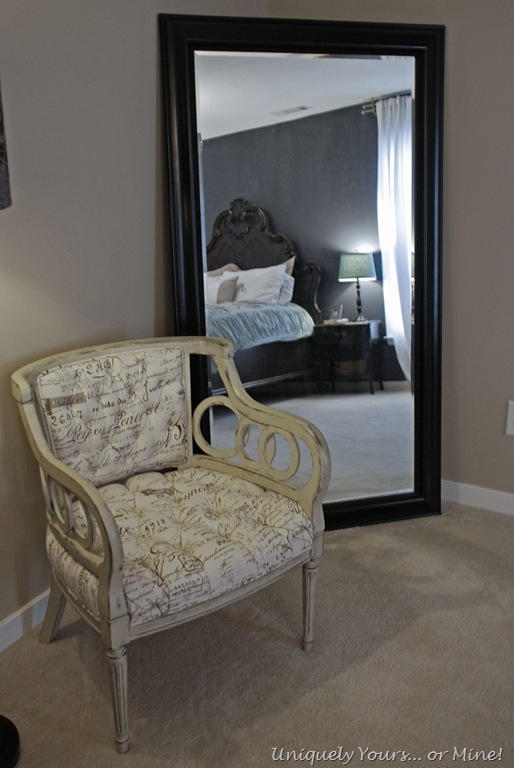 The chair is amazing, gorgeous, beautiful….it’s a perfect creation. I love the fabric you picked and the paint, they go perfect together. I would keep it too. I’m glad I am not the only one who thought I should keep it! Thanks for stopping by! You did an amazing job. I would love to find a class like that near me. I have to see if there is such a thing. You picked a tough project with all of the tufting, but the end result is stunning. Stopping by from Marty’s party. Thanks Judy! I hope you find a class.. It’s so worth it! This chair is simply stunning. 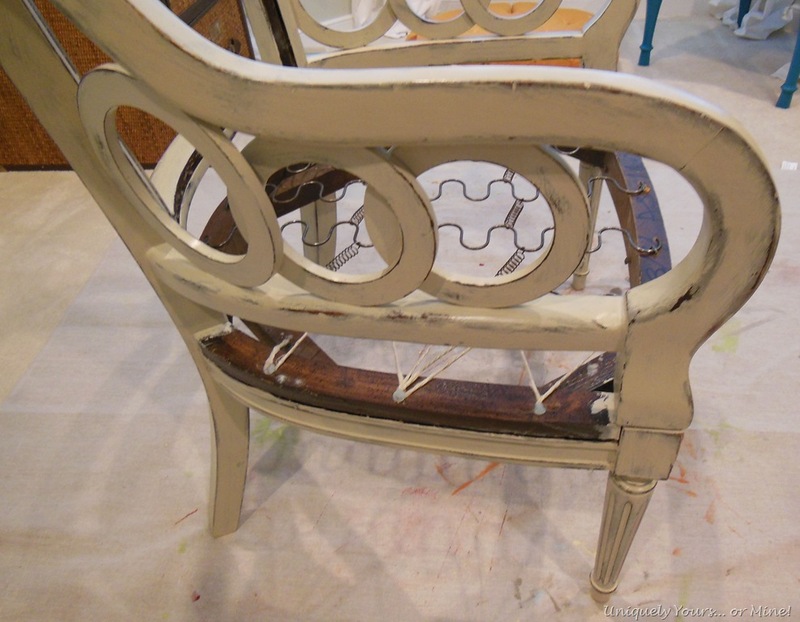 Painting it really brought out the great design of the chair, and your upholstery is amazing ! Wow! Thanks Fiona, your compliments are so touching to me! I am so in love with this chair it’s crazy! If you ever part with it please let me know…Great Job! You are so sweet! Thanks so much Denyse, it’s always nice to hear someone else loves something you did too! Stopping by from Table Top Tuesday to admire your upholstery handiwork. That is an awesome job and there is no way I could sell it after working so hard on it! I have two slipper style chairs that I am slowly taking apart to reupholster but it is a little scary. I don’t think I will be putting the tufting back on them because that looks hard. I really liked the paint/distressing you did to the frame. Awesome! You go Bonnie! I say try the tufting, it helps if you already have the holes in the original foam.. Good luck! 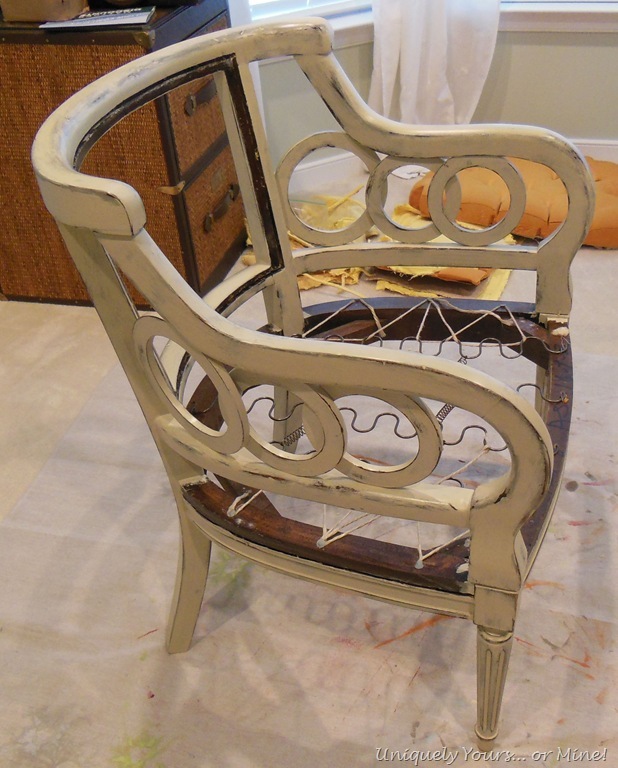 WOW – you did an amazing job, that chair looks beautiful! The tufting is fantastic – I think I might need to look into a course for next year. A think I see a New Years resolution in your future Catherine 😉 thanks so much for your kind words! WOW! it looks beautiful! the tufting is amazing and love the arms! Thanks Cassie… it wasn’t too bad to do, but I was nervous because I had NO extra fabric if I messed up.. Yikes! I love that chair. What a great fabric and you did a fabulous job. I don’t blame you one bit for keeping it. fantastic job. it looks like a professional did it. Uh… WOW!! That’s all i can say!! I didn’t know there even was such a things as an upholstering class!! That is awesome!!! Your chair turned out fabulous!!! I’m off to go see if I can find a class too!!! Wow, what a gorgeous chair! 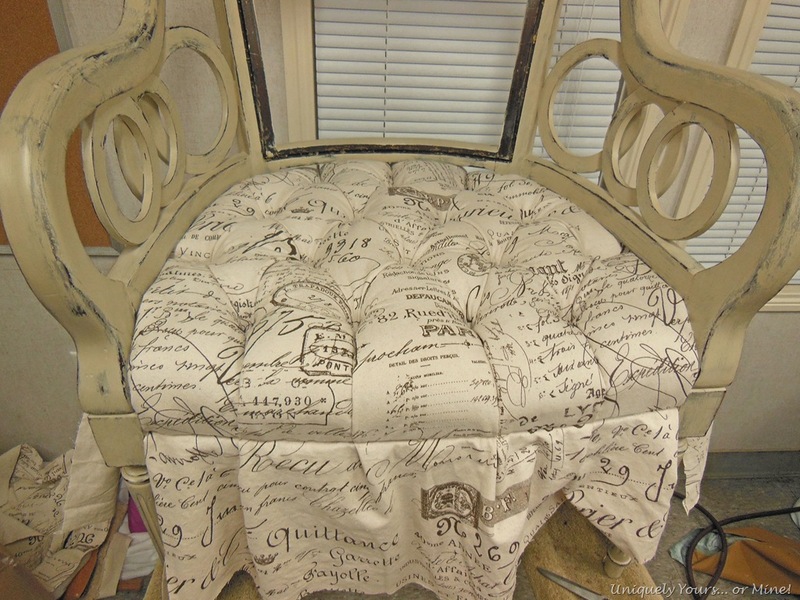 I love the fabric, and love the way you finished the wood as well–just super. This is fabulous! I love the colour and fabric choices, you did a great jo! Your chair is fabulous. I REALLY, REALLY want to take an upholstery class but I live in a rural area and there aren’t any that I can find in a 60 mile radius. 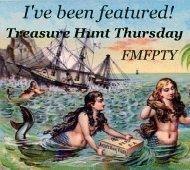 So whatever tips you care to share with us would be greatly appreciated! I have a tufted chair that I want to tackle. Your pictures gave me a little insight on how I might do it. Thanks! Enjoy that lovely chair! You are so sweet Kim, thanks so much! You could also try to get someone who does upholstery to teach you… also when you tear a chair down take lots of pictures, even notes, to try and remember how it went together… Also get a GOOD stapler… Very important! Good luck! Gorgeous! Love that fabric. 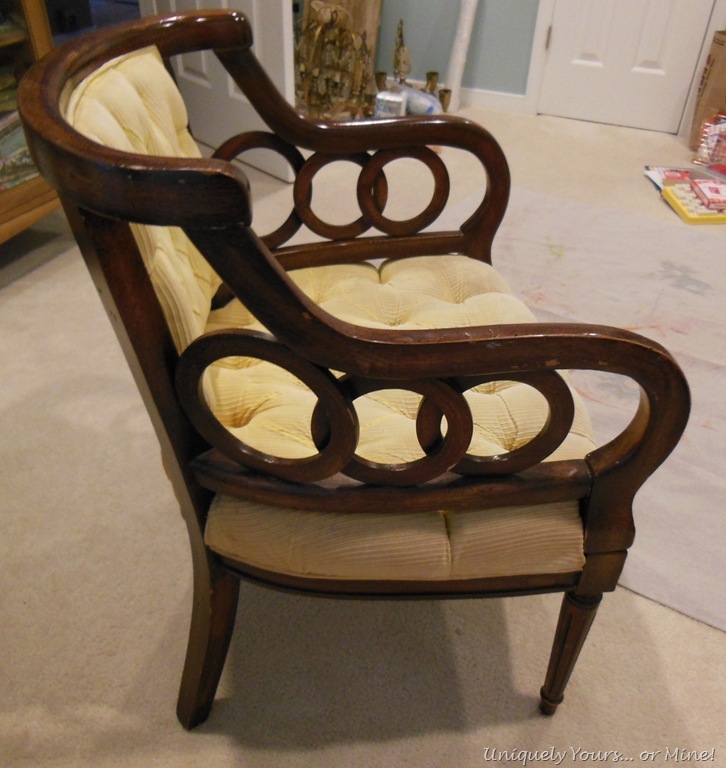 I’m featuring your chair in the PoPP Spotlight this weekend. It is so perfect it looks store bought (meant as a compliment of course!) Great job…thanks for sharing! Absolutely freaking gorgeous!! Great fabric choice! Thanks Kathryn! I’m linking up a new project today! Kathy I found mine at a local fabric store, but Ballard Designs carries the fabric, Document, is what it is called.. Thanks so much for your lovely comment! I am so thrilled you linked this up with me! 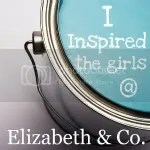 I have been seeing it around the blogosphere and I am a huge fan. Gorgeous! 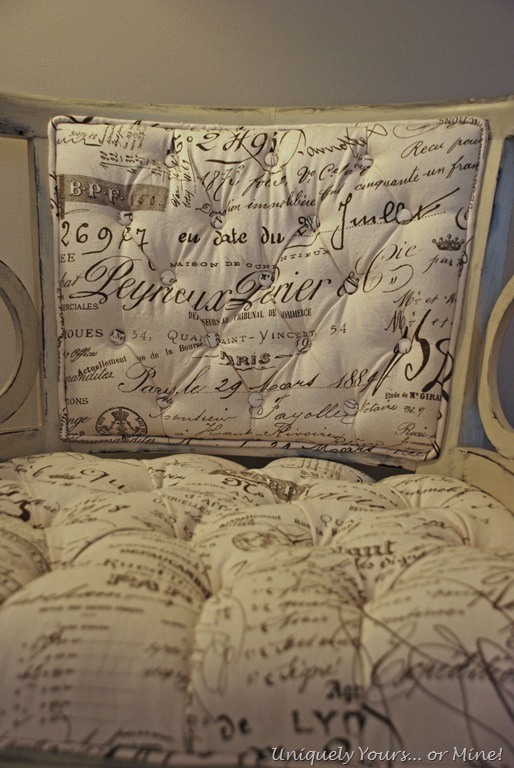 Pingback: How to Upholster a Settee | Uniquely Yours... or Mine! I know this comment is 1 1/2 years late, but I just found your blog and wanted to tell you I have the exact same chair. I found it in a thrift store in Yakima WA in July 2013. Mine doesn’t have a tufted seat, in fact mine has a loose cushion. I haven’t been sure what I wanted to do with it, but I will definitely keep it, too. What a small world. Hey Lauren, I have seen a couple others since I did this chair too. They didn’t have the tufting either. It’s a cool chair, I hope you find a perfect place for it in your home, thanks for stopping by!